The AISH Oasis Day kicks off our Monday together. As a full AAIE community our first CONVERSATION session begins at 2:30PM (gather in the ballroom at 2:15PM or so) with Will Richardson, Anthony Magana, Tim Carr and Richard Gaskell on stage. Be sure to pick-up your name tag and REGISTER at the AAIE table adjacent to the ballroom before 2:00PM. We want to run a professional conference, so please do keep your name tag on the lanyard and with you during all sessions. 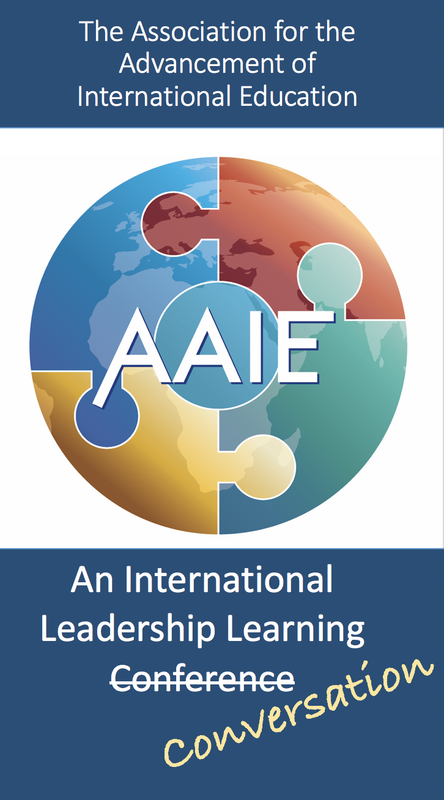 Everyone, connect to and use the AAIE APP (blessedly easy to use– see Chris Nini at the registration desk if you need help) so you stay current with each hour of each day. We'll be sending reminder messages that go straight to your smart phone screen. You know by now that our AAIE board of trustees has set in motion new ideas to directly challenge the status quo of this conference. Everyone, bring your best game to the coming days of discussion and debate. Let's give the new approach to our learning a thorough test and we can hopefully agree that success for the coming days resides within each of us. Your voice is essential to a spirited exchange. Be sure to gather in each and every new AAIE member too. We have vectored into San Francisco from all points of the globe with shared purpose toward "Being on Time for the Future" and advancing our leadership learning because of what we can gain from each other. We also want to inform you that the AAIE Annual General Meeting will be held in the ballroom at 5:00PM on Monday. By policy, we must inform you that we will be seeking member approval to name current trustee, Oli Tooher-Hancock as President-Elect and Madeleine Maceda Heide as a new trustee. Based on prior AGM approval, Jeff Paulson will replace Kevin Glass as AAIE President on February 7, 2019.